A majority of vendors, shoppers and pedestrians had one thing at the top of their wish list- a political leader, who would ensure public welfare and relief. In spite of a rather disheartening, bleak political situation, the crowds in Pettah were bustling in swarms. Fluctuating living costs, rising dollar rates and continued instability have set the theme for this year’s festivities. For Shirani Dawlagala of Maharagama Christmas was something she could not avoid celebrating. “No matter how high prices rise, Christmas is something we cannot avoid celebrating,” she said. N.M.N Mohommad Asmin, the chairperson of the Pettah Public Market delved into recent struggles as both a businessman and a breadwinner. 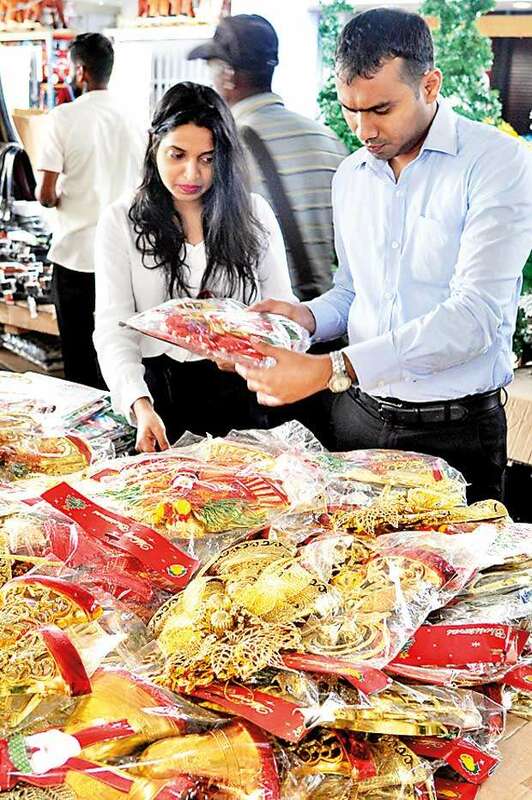 He explained that his sale of festival decorations had faced many setbacks this time around; higher wholesale prices, less hired helpers and an apparent fall in customers to name a few. “Last year we sold this item for less than Rs. 200, this year it’s Rs.250 or more. Even still, we are barely making profits.” he said. He continued that they had had no relief for the losses incurred as a consequence of political uncertainties. 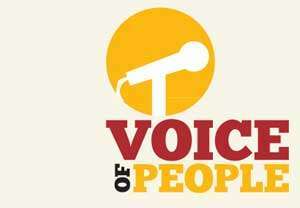 However, there were also some who perceived the country’s status in a positive light. 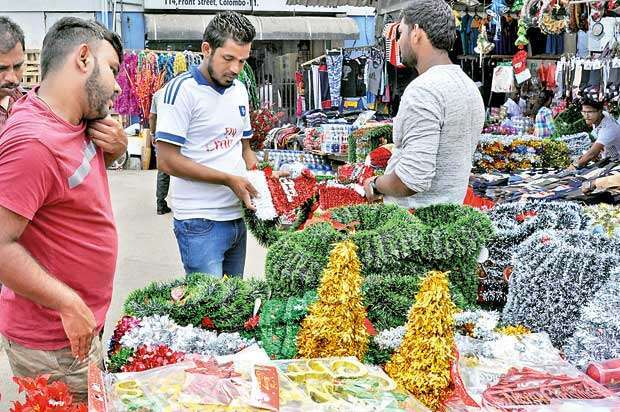 Roshan Samsudeen from Wattala has been maintaining his Christmas Tree business for five years now. He claimed that he had not noticed a notable change in business, due to the politics of the country. He also believes that since the political crisis had been settled, some good would come of it. He expressed content with regard to the decision of the authorities to relocate the throng of street vendors on the pavements in a common market area. In his opinion, it’s only appropriate that they set up in their allocated spaces instead of taking to the streets to attract more business. Amidst Christmas shopping were also preparations for the New Year; countless mothers bargaining for school uniforms, books and stationery. Wijayanthi Rajakaruna from Wadduwa was among them. “Regardless of political turmoils, life has to go on,” she said. Children looked forward to Christmas all year and hence skipping it was no longer an option, according to Darshini Jeyapragasam from Wattala. “We celebrate Christmas because we have little children. Just like buying school books in December, it has turned into something we must do,” she said. New Year resolutions are generally based on personal change and alteration. This year, however, most have resolved that a change in government was what the future needed. "Last year we sold this item for less than Rs. 200, this year it’s Rs.250 or more. Even still, we are barely making profits"
Shirani Dawlagala elaborated on how the common man carried all the burden and made all the sacrifices, but the power grabbers enjoyed all the rewards. “A group of intelligent people must be elected into office to replace these crooks. We work hard; study in Universities ,and make do with small jobs. We wait around 60 years for our pension, while they can get it in a matter of five-six years,” she said. Although the masses were divided in, where their support lay, they were generally in agreement that the New Year must bring stability, selflessness and honesty in the way the nation is led. Regardless of strife, Christmas decorations are being put up, Christmas sales are in full swing and Christmas shopping is underway. Regardless of ethnic and religious differences, the New Year is awaited by all, with the hope that living costs will plunge and living standards will surge through able leadership. “Now that the Government has been restored to its original state, some good will come of it. “I believe we need a change of government. I am a strong UNP supporter, but it’s undeniable that while MR was in power, he made a difference. “Regardless of political events, our lives go on. Our children are starting school and we are busy with that. Politics only benefits those in power. We are inconvenienced when roads are obstructed. “There should be a change, the only thing that has changed is that instability has worsened.